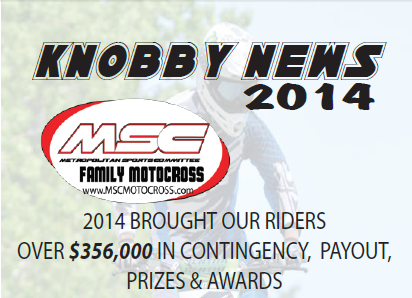 Riders who race MSC Motocross know the banquet is getting closer when they get a copy of the Knobby News in the mail. Since we have this groovy thing called a WEBSITE, we figured, why keep you waiting. Riders will still get a copy in the mail AND be able to show their buddies that they are famous! Well sort of famous. If you get points as a MSC Racer in 2014, your name is in the Knobby News. The “Knobby News” Season Yearbook has been produced by MSC for many, many years. It takes a ton of time, working with the 5 tracks, some advertisers, company’s offering contingency, and really just laying it out for print. In the end, it is really worth the effort, seeing those names listed shows all the dedication many of you put forth to race our tracks week in and week out. We sincerely appreciate that. Please make sure you download a copy after 1pm 12/30/14. High Points Results from DBMX were updated. Please take a look at those companies who advertised with us this year. Check their websites out and if you are looking for something they offer, give them a shot. Let them know that you saw their ad in the MSC Knobby News. Remember the banquet is getting close, FEBRUARY 15TH AT THE HUDSON VALLEY RESORT. Get your reservations in quickly as table selection is filling up FAST!